An aircraft engine is a propulsion system for an aircraft. Unlike automobile engines, those in an aircraft runs at elevated power settings for very extended times. In general, the engine runs at a maximum power for a few minutes while taking off, at a little reduced power for climb, and then spends the greater part of its time at a travel setting—typically 65% to 75% of full power. For this reason aircraft engine designs have a tendency to favor reliability over performance. Aircraft engines also tend to use the simplest parts and include two sets of anything needed for reliability, including ignition system (spark plugs and magnetos) and fuel pumps. 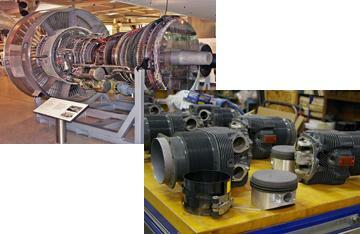 Major developers on aircraft engine parts are General Electric. Pratt and Whitney, Rolls Royce, and Bristol. GE is one of the world's leading manufacturers of large jet aircraft engines, and has product categories catering most commercial airframes. Each of their engines surpasses the industry in its respective power class for reliability, maintainability, and cost of ownership. Their major engines include CFM engines and those designed for Boeing and Airbus airplanes. For specific list of Airbus and other OEM”s airframe parts and accessories that we cater, please click on the link below.